Nucleoside analogs frequently constitute the backbone of chemotherapy regimens in malignant diseases, however success is variable and often unpredictable. The identification of biomarkers to guide treatment decisions as well as novel therapeutic interventions to overcome chemoresistance are urgently needed. 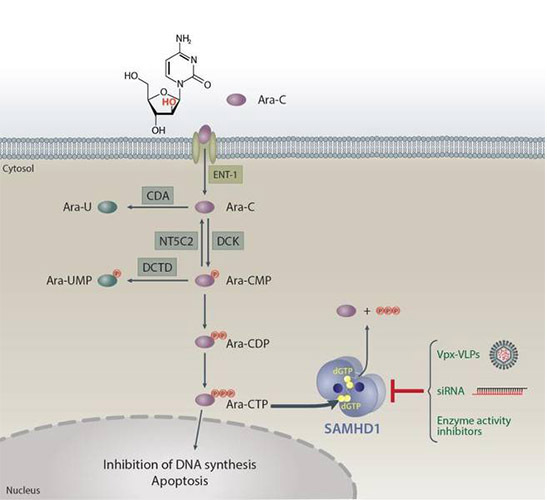 Together with the group of Prof. J. Cinatl in Frankfurt we recently discovered that expression of SAMHD1 hydrolyzes and thus inactivates important metabolites of several of these nucleoside analogs and, importantly, predicted therapeutic success in patients with acute myeloid leukemia (AML). to advance the optimization and preclinical assessment of intervention approaches targeting SAMHD1.